Katherine S. Conway-Turner, Ph.D., was formally installed as the ninth president of SUNY Buffalo State on Tuesday, October 21. The historic rite, held in the Performing Arts Center at Rockwell Hall, was attended by more than 700 guests, including New York Lt. Gov. Robert Duffy, Buffalo Mayor Byron Brown, SUNY Chancellor Nancy Zimpher, former Buffalo State President and SUNY Chancellor Emeritus Bruce Johnstone, and College Council Chair Howard Zemsky. For her inaugural theme, Conway-Turner selected, "Reaching for the Stars: Engagement, Excellence, and Social Responsibility," referring to all that Buffalo State is and all that it can be. "Our footprint is vast. Our path has not always been simple, but it has always been illuminated by the passion that has produced balanced, knowledgeable, and committed leaders across many fields of study," Conway-Turner said in her inaugural address. "Today we stand together as a campus that is ready to build on the tremendous foundation of the past while we move toward the future. Now is the time for our reach to touch the stars above and around us. Now is the time for the Buffalo State community to hold steady the ladder and allow our students to meet the challenges they face." The formal ceremony included an academic processional and outstanding performances by the Buffalo State Chamber Choir, Elmwood Swing, and student soloist Kathryn Allison singing "I Believe I Can Fly." This historic inaugural event was preceded by a week of celebrations. Students, faculty, staff, and alumni came together for evening celebrations, receptions, a faculty and staff recognition ceremony, and two ribbon-cuttings—for the TeachLive Lab and the Houston Gym. Also, approximately 400 individuals participated in the Buffalo State Day of Service on October 18 in which they worked on a number of projects throughout the city. 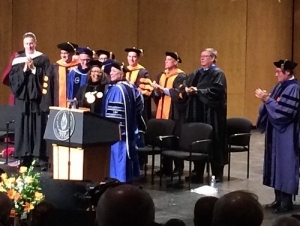 Many dignitaries, including those who have worked with Conway-Turner in the past, expressed their extreme faith in her ability to lead Buffalo State and forge even stronger connections with students and the community at large. Other speakers who only recently met Conway-Turner shared the favorable impression she has made over the last couple of months. "In a very short time, it has become clear that Dr. Conway-Turner not only understands Buffalo State, she celebrates it," said Paul Lamparelli, '82, chair of the Buffalo State Foundation. "Through the conversations she has had throughout the campus, she has demonstrated an affinity and a quick understanding of the college. And we are very grateful."